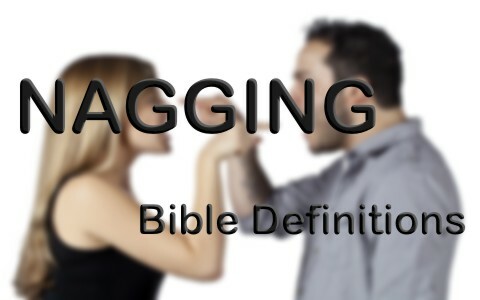 What does the Bible say about nagging? Is there something we can do about it? Nagging is something that most of us do and may not even realize that we’re doing it. Someone that is nagging is continually complaining and finding fault with someone or something, whether it’s real or imagined. They can be complaining on a consistent or persistent manner that is totally unrelenting and displaying a repetitious behavior in the form of pestering, harassing or otherwise continuously arguing with an individual about previously discussed requests or acts. During the Middle Ages, a person who was accused of nagging would sometimes have to wear a Scold’s Bridle which was placed over the head and restricted the use of the mouth, so as to stop the nagging. At that time, it was seen as sin but is nagging a sin? What will you do with your words today? Build up or tear down? Solomon wrote that “It is better to live in a corner of the housetop than in a house shared with a quarrelsome wife” (Prov 21:9) and wrote, later in this same chapter, that “It is better to live in a desert land than with a quarrelsome and fretful woman” (Prov 21:19) but it’s not just women who nag. Men do the same thing but in different manners. Since it is true that “A word fitly spoken is like apples of gold in a setting of silver” (Prov 25:11) then the opposite must also be true that a word not fitly spoken can be like a rotten apple sitting in a rusted container, as there’s nothing beautiful about unfit words coming at the wrong time. Solomon compares a complaining person as being like a rainy day, as he wrote “A continual dripping on a rainy day and a quarrelsome wife are alike; to restrain her is to restrain the wind or to grasp oil in one’s right hand” (Prov 27:15-16) but as I wrote earlier, it’s not just women who nag. It can be children nagging their parents, a spouse nagging their spouse, an employee nagging their employer. The possibilities for nagging are as unlimited as the number of people there are in the world so we have to rid ourselves of the idea that it’s just women nagging their husbands. It can be the other way around because everyone can nag at just about anyone over just about anything. The Apostle Peter, in writing to church leadership, wrote that the “shepherd the flock of God that is among you, exercising oversight, not under compulsion, but willingly, as God would have you; not for shameful gain, but eagerly; not domineering over those in your charge, but being examples to the flock” (1 Pet 5:2-3). In other words, pastors, elders, teachers, deacons, and any other church leader can nag those who they communicate with. One way to solve the nagging problem is to take the Apostle Paul’s advice and “Let no corrupting talk come out of your mouths, but only such as is good for building up, as fits the occasion, that it may give grace to those who hear” (Eph 4:29). Father’s nagging can provoke their children to wrath and discourage them. (Col 3:21) but fathers can also provoke them to anger (Eph 6:4). When we are continually nagging someone, we can make them discouraged, angry, bitter, and force them to respond in a very un-Christian way so Paul would remind us all that we are to “Love one another with brotherly affection. Outdo one another in showing honor” (Rom 12:10) and think about “whatever is true, whatever is honorable, whatever is just, whatever is pure, whatever is lovely, whatever is commendable, if there is any excellence, if there is anything worthy of praise, think about these things” (Phil 4:8). Just think of Jesus’ words, “And as you wish that others would do to you, do so to them” (Luke 6:31). To the church in general, the author of Hebrews writes that we are to “Obey your leaders and submit to them, for they are keeping watch over your souls, as those who will have to give an account. Let them do this with joy and not with groaning, for that would be of no advantage to you” (Heb 13:17). To nix the nag, we should be careful to “not rebuke an older man but encourage him as you would a father, younger men as brothers, older women as mothers, younger women as sisters, in all purity” (1 Tim 5:1-2) and we should be “Addressing one another in psalms and hymns and spiritual songs, singing and making melody to the Lord with your heart, giving thanks always and for everything to God the Father in the name of our Lord Jesus Christ” (Eph 5:19-20) and not nagging one another. Nagging only leads to arguments, discouragement, and anger so remember that words can hurt or they can help. Words can tear down or they can build up. Words can create anger or it can calm an angry person. Proverbs 15:1 will always be true in that “A soft answer turns away wrath, but a harsh word stirs up anger” and that includes nagging so the conclusion is that it’s “better to live in a corner of the housetop than in a house shared with a quarrelsome wife” or quarrelsome husband (Prov 25:24). What will you do with your words today? Build up or tear down? Jack, thank you for the reminder of how powerful our words can be, for good or for evil. Great article brother! Thank you Pam. You are so kind. I was only reminded of this when I started looking at Scriptures and I myself was convicted but all glory to God but still, thank you for the encouragement.